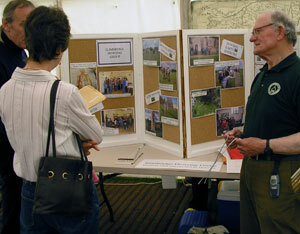 Peter Golding dowses the layout of Dursley Castle on the recreation field to interested onlookers. "Yes, but how do you do it?" was one of the most-asked questions at our stand in the marquee at Dursley Festival on Sunday 13th July. The sun shone, the rain stayed away, and we had great fun marking out the site of the long lost Dursley castle. Dowsing revealed that the castle was built between 1100 and 1200 AD, and was in ruins by the late 1700s/early 1800s. As people entered the recreation ground from the swimming pool car park, and stepped over our markers, we were able to tell them, "You are now in the banqueting hall!" and explain that there were kitchens below. Several people also crossed the moat, but no one got wet. Typically in the 1800s people would have taken the stone from the castle ruins in order to build elsewhere. We were told a quantity of large stones has been discovered during the building at Rednock School, and we wonder whether they could have been from the castle too? As to how do we do it? Nobody knows! Dowsing is simply an instinctive ability we all had originally, was lost over the centuries, but fortunately handed down within a few families. 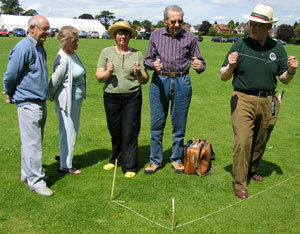 Rediscover your own dowsing skills - they’re in there somewhere.